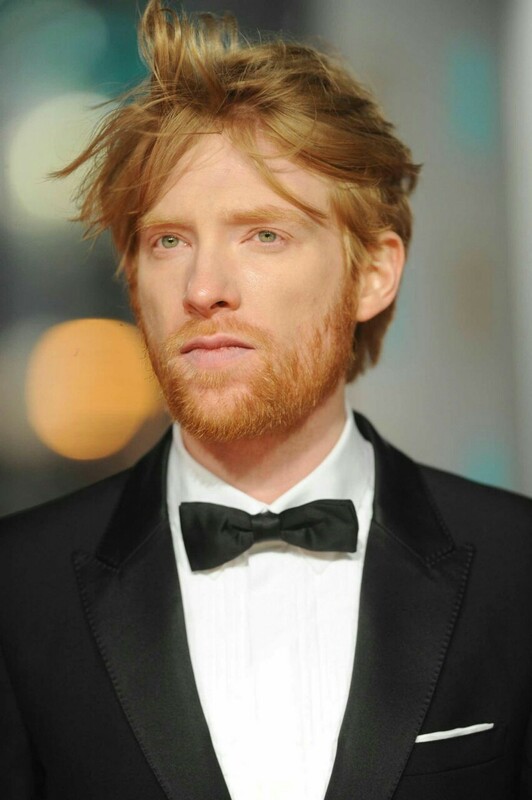 Hell no, Domhnall Gleeson is gorgeous. He thinks he's so cool. "How Kylo Ren sees me..."
I'm going to be laughing about that for days.. The shape of the eyeholes on Kylo's mask is not quite right. These Hux lines from the Lego TFA game crack me up Does Kylo just follow him around levitating a toy X-Wing? ughghhghghghghghg my ovaries just exploded. No wonder Pabs keeps getting lost in his eyes haha. But that tweet about Hux's eye color is interesting, because in TFA during his Nazi monologue they seem incredibly icy blue, but Domhnall's are more green and in TLJ they seem blue-green. Maybe they changed to icy blue because of the ice in his veins! But damn, with his messy hair and beard.....whoooo. so handsome. 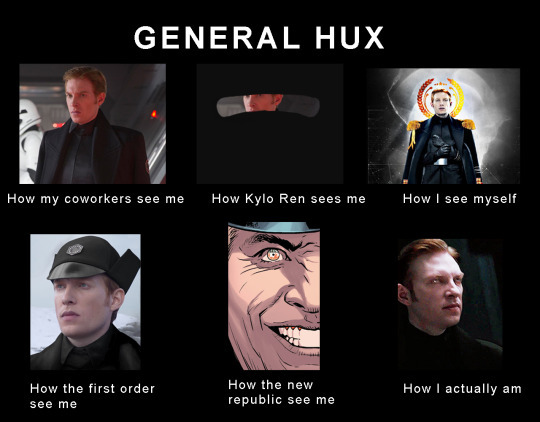 Also, I don't hate Hux. Like, yes I do hate him for being a terrible guy. Like I'm not condoning his maniacal beliefs at all. But Domhnall is amazing playing him and the character is a good villain. guys with ginger hair are usually not my type- BUT he is so adorable in interviews - with messy hair and scruffy beard he looks cute. His performance as Hux in TLJ is fantastic...the faces he makes and the looks he gives Kylo are Oscar worthy. I'm sure we will see more of him in IX and that he will have a more serious role as in TLJ. Isn't there a quote somewhere to the effect of "I wanted to play him in such a way that children watching the movie would immediately know that he's not a good person and somebody you'd like to punch." E.G., I'm very much playing him as a villain you root against. Good money says that Sux and Rey will finally meet in IX and that he'll likely try to use her as part of antagonizing/undermining his rival. @snufkin wrote: Isn't there a quote somewhere to the effect of "I wanted to play him in such a way that children watching the movie would immediately know that he's not a good person and somebody you'd like to punch." E.G., I'm very much playing him as a villain you root against. They've been pairing the actors in interviews and they're in another movie together. They re-teamed the pairs who were together in Ex-Machina and Inside Llewellyn Davis, so I'm betting that Hux finally meets "thuh guuuhhhrrrl" he's heard so much about in IX. And that things will be super dramatic, including how if he so much as bothers Rey, it's not going to go well for him. Right? It's really going to force Kylo's hand in some way. After all, Kylo's story was that Rey (who he brought to Snoke in handcuffs) somehow managed to free herself, kill Snoke, kill all of the Praetorian Guards, knock Kylo unconscious (but leave him alive), and escape in Snoke's shuttle. You know that there's no way that Hux believes that story on face value, but he can use it as leverage against Kylo, who would otherwise need to confess to treason. I have this vision in my head of Hux wanting to "test" Kylo because he's suspicious about his attachment to "the girl". So he launches an attack where he knows Rey is without asking Kylo for approval and when Kylo flips out about it, Hux knows he has his answer. Maybe that's what fuels a potential coup. @ISeeAnIsland - Ideally it's a situation that really finally forces him to make a choice, her or the power that he's acquired by allying himself with the FO. He's tried twice now to win her over and it hasn't worked out. Not that Rey isn't obviously into feeling the Force or whatever w/him. Just she's made it clear at this point that she's not going to sell out her values/friends in exchange for being with him. He wants her, he's gonna have to get on board with that. She's obviously powerful because Hux had to rescue him the first time around and then finds him again knocked out. So it seems like a pretty clear set-up from a writer's PoV, they have this shared mutual dirty secret which is too big to not come out and cause drama. @ZioRen wrote: I have this vision in my head of Hux wanting to "test" Kylo because he's suspicious about his attachment to "the girl". So he launches an attack where he knows Rey is without asking Kylo for approval and when Kylo flips out about it, Hux knows he has his answer. Maybe that's what fuels a potential coup. Something like that scenario could be a great setup. (I've seen a few post-TLJ fanfics already explore something like this.) It could force Kylo's hand into warning her about the attack to save her life (heck, possibly reminiscent of the mysterious "data card" warning from TFA)--especially if Hux, Kylo, and a few other trusted FO officers are the only ones to know about the attack. So, this would give us a Kylo-saves-Rey (and the remains of the Resistance probably) in a way that is more selfless and not a repeat of the Throne Room Scene. @snufkin wrote: @ISeeAnIsland - Ideally it's a situation that really finally forces him to make a choice, her or the power that he's acquired by allying himself with the FO. He's tried twice now to win her over and it hasn't worked out. Not that Rey isn't obviously into feeling the Force or whatever w/him. Just she's made it clear at this point that she's not going to sell out her values/friends in exchange for being with him. He wants her, he's gonna have to get on board with that. She's obviously powerful because Hux had to rescue him the first time around and then finds him again knocked out. So it seems like a pretty clear set-up from a writer's PoV, they have this shared mutual dirty secret which is too big to not come out and cause drama. It was smart of Rian to set up Rey's obvious reciprocal attraction in TLJ, because now Kylo knows that he at least had a chance with her... So, it makes it less pathetic (god, I hate that word) for him to choose Rey over power at this point, too. If Rey had never shown any signs of returning his affection/feelings, then him choosing her (and likely betraying the FO in some way) in a totally selfless move would probably seem a bit pathetic. Yes! I was just thinking about that and how we still don't know the answer to it. If they want to reveal that Kylo sent the warning to Leia back then, they could easily double up that reveal with Kylo sending a potential warning to Rey. In the version of the movie where Leia was still a prominent figure, I could see that being something that came into play. @ISeeanIsland wrote: It was smart of Rian to set up Rey's obvious reciprocal attraction in TLJ, because now Kylo knows that he at least had a chance with her... So, it makes it less pathetic (god, I hate that word) for him to choose Rey over power at this point, too. If Rey had never shown any signs of returning his affection/feelings, then him choosing her (and likely betraying the FO in some way) in a totally selfless move would probably seem a bit pathetic. There've always been audience members who thought it would be one-sided and that he'd end up sacrificing himself for her a la Sydney Carton. But interesting thing is that one of the films RJ mentioned watching after word got out he'd been hired to write/direct was Hou Hsiao-Hsien's The Assassin, where executive summary is that it's about a young woman groomed from an early age to be an assassin/enforcer whose punishment by her Master for perceived failure over a job due to compassion is to task her with taking down the man who was her childhood sweetheart. It goes badly in the end for said Master. We got that in a way, Snoke's end game was to identifying and destroying the person who's the Champion of the Light because they're a threat to his control over the galaxy. Which turned out to not be Luke, but Rey. And it ends up destroying Snoke instead because of the feelings Ben and Rey have for each other. IDK - I was as steeped in the OT as a kid as a lot of fans and my immediate gut reactions when I first saw TFA were 1) Not Reylated and 2) Not so much an epic Hero-Villain tale as it was an epic Love Story. TLJ didn't disabuse me of either of these notions and I hope that IX continues to run with conclusion #2 in a way that does justice to the potential. Right? 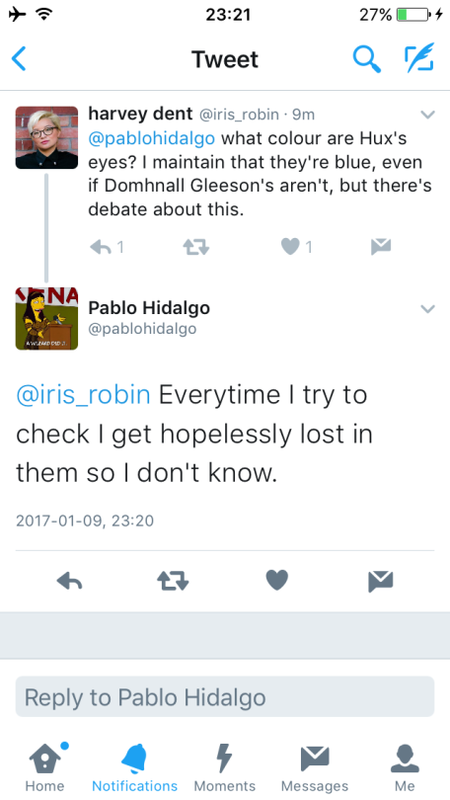 And Pablo had a tweet at one point alluding to the fact that we didn't have the whole story on the datacard (yet)...and that Kylo and Leia had a complicated relationship. The datacard bit didn't surface at all in TLJ...maybe it's meant to surface again in IX? Or maybe it was meant to surface in an earlier draft of IX (pre-Carrie's death)? Another thing that I like about the scenario that we're describing here (i.e. Kylo having to warn Rey about an attack) is that if he can't do it through the Force Bond, he might have to find some anonymous way to do it....so Rey/the Resistance might not know who actually tipped them off. OR...Maybe Kylo does warn Rey through the Force bond. What does Rey do with that then? How does she explain to the Resistance that she learned of the attack? That would sort of force the Force bond out of the bag (no pun intended). 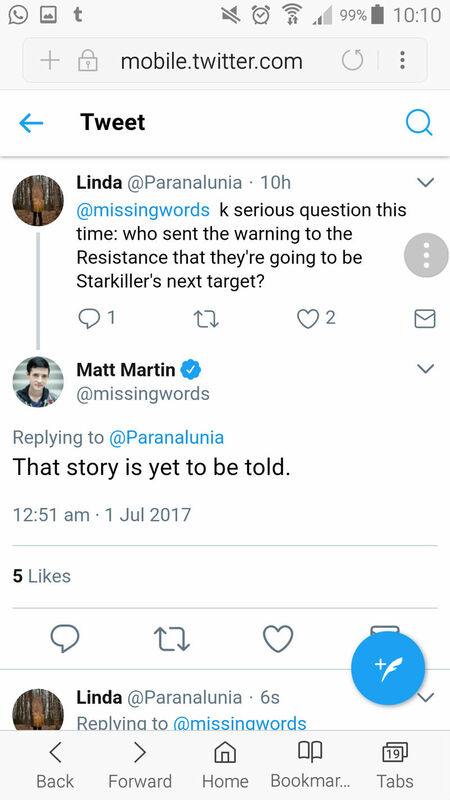 And would Poe even believe her/Kylo, if he knew that a warning came from Kylo? 2) The guhhrrrl who's caused so much havoc to the First Order and led to the Supreme Leader's deposal/his work rival becoming his boss is the new Supreme Leader's sekrit Skype girlfriend. 3) Oh and obvs, above havoc and Supreme Leader Kylo Ren is because he murdered Snoke for threatening his girlfriend. I think it would be kind of funny in IX if somehow Kylo strikes up conversation with any pick of force ghost, let's go with Anakin. As Rey has somehow managed to shutdown the connection between Kylo and herself pretty airtight, indirectly a message (from Kylo) then gets relayed to Rey that she is in trouble and word gets around fast in force ghost land. Then finally, Obi-wan makes a force ghost appearance to Rey, and let's her know that Kylo has been trying to give her the head's up, thus making her re-think about the force connection she has with Kylo, et cetera.